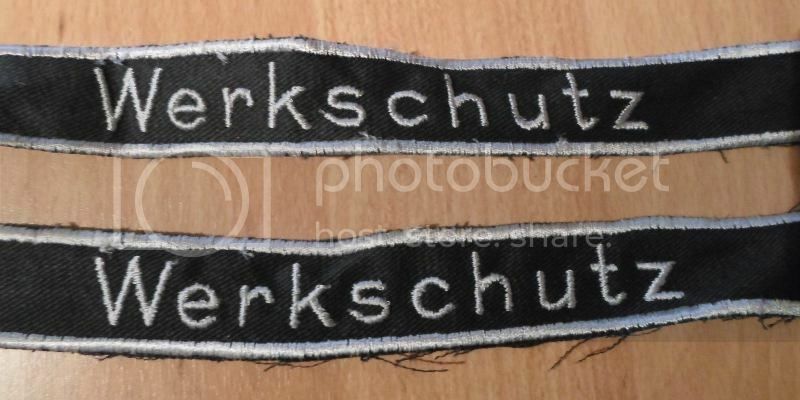 Post your Werkschutz insignia, photos, uniforms, etc. Awesome items. I wish I could find things like these. Some very interesting and rare items have been shown on this thread, has anyone got more to show? Really enjoyed looking through the insignias, and especially the paper items! Thanks Dave! This is a salt & pepper grey Werkschutz Leutnant summer tunic. The sleeve insignia is also bullion and S&P to match the tunic. The sew in shoulder boards are interesting in that they are more narrow than standard Polizei boards, although they mimic the style. Thanks Howard. This is the one and only Werkschutz Officer grade tunic that I have ever seen in the flesh. For anyone who is interested there is an fascinating book from Christopher Browning called 'Remembering Survival' about the Starowiche labour camp which contains an insight into (some) Werkschutz day to day activities. Not sure how typical it would be in terms of their role and there are often overlapping references to 'Ukranian Guards' etc. However I'd highly recommend it. I will post this new found baby here too.